É a mais recente edição da Public Spaces e é uma edição especial para comemorar a união entre esta netlabel portuguesa radicada em Barcelona e a netlabel argentina Gorríon de Miga. 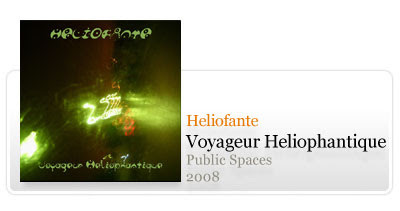 “Voyageur Heliophantique” do projecto Heliofonte é o primeiro fruto desta amizade. Um Ep de 4 temas de sensações e ambientes bem densos. Um convite ao relaxamento e a uma viagem introspectiva. Heliofante is a dream. A dream out of the head of one of the founders of the argentinian netlabel “Gorríon de Miga”. He dreamt about an elephant that lived in outer space and enjoyed his life in the sun. This elephant had giant ears and lots of tails. Working together with his partner, they came up with the idea of making the soundtrack so this elephant could enjoy its life even more and that could also capture, even faintly, the sensations caused by the dream. The result is of a rare beauty, sometimes intrusive, sometimes so relaxing that one can close the eyes and see that elephant with it’s huge ears and lots of tails flying around the sun with a smile.